I’m back from the golden, sunshiny Utah autumn woods, where a buddy (Stanley Barton) and I just returned from climbing Kings Peak, the state’s high point. We hiked and camped and clambered up scree slopes with two Park City friends — Rett Clevenger and Jeff Burford — in a quick ascent. 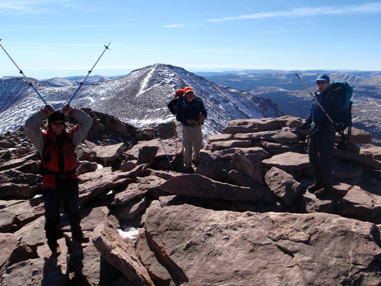 The peak, which tops out at 13,528 feet, is non-technical, meaning hiking boots and trekking poles — not ropes and ice axes — can get you to the top. 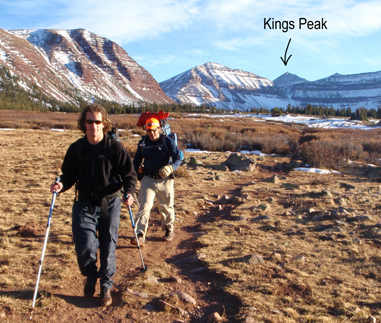 But as highpoints go, Kings is one of the more remote, sitting far off any beaten path in northeastern Utah’s Uinta Mountains. We started the 28-mile roundtrip journey at 7pm on Sunday night, following the beam of a headlamp into the woods and toward our goal to camp near Dollar Lake, the halfway point. Rett (front) and Jeff near Dollar Lake. For navigation, I employed National Geographic’s Trails Illustrated High Uintas Trail Map (http://shop.nationalgeographic.com/product/610.html), a 1:75,000 topographic mainly created for hikers. But I found the map’s detail to be more than enough for mountaineering, with precise slope shading making contours and elevation pop from the page. Small ponds and marshes were present on the map and accurate, and we even got water from one tributary. Our route was more or less the traditional way up the mountain, beginning at the Henrys Fork trailhead and heading due south to Dollar Lake (which we reached by about 10:30p.m. the first night, and where we camped out under the stars). We deviated from the trade route in one respect, skipping the normal switchbacks through Gunsight Pass on the way up the mountain in favor of a steeper direct route up a scree-field and chute that spit us out nearly on Kings Peak’s spine. Jeff, Stanley and Rett negotiating steep and slippery stone in the scree field chute just above 11,000 feet. The summit ridge — a jumble of stone with precipitous drops off the west face and turret-like blocks balanced precariously — made for the most rewarding part of the climb. After the loose rock and scree below, hopping uphill from solid block to block was satisfying progress. On top, the air must have been 50 degrees. The sun was high and hot. No wind. Rett cracked a tin of herring kipper snacks and crackers then passed the vessel around. A picnic on the top of the state. 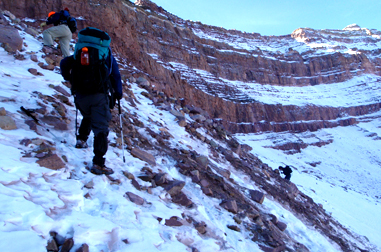 The hike out was long and jarring, with thousands of vertical feet and more than 15 miles of backtracking to the car. We took Gunsight Pass in lieu of the scree chute, then trekked past Dollar Lake (picking up pads and sleeping bags stashed from the night before), then flipped on the headlamps once again on the final seven mile section out. 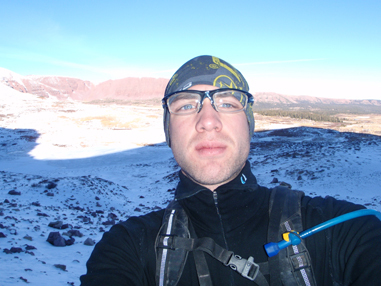 The Gear Junkie self portrait, halfway up the scree chute. We finished around 7:55 p.m., just more than 24 hours after leaving the car. Cranked up the heat. Pulled the rental into drive, and motored away in the dark, headlights beaming into black woods, an empty wilderness where we saw no other soul for our long day climb of Kings Peak. Maps with our route below. 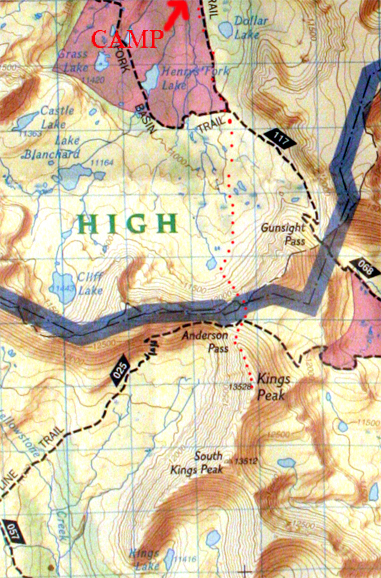 MAP 1: Henrys Fork trailhead to a camp near Dollar Lake, the halfway point, Map scan courtesy of National Geographic’s Trails Illustrated High Uintas Trail Map. 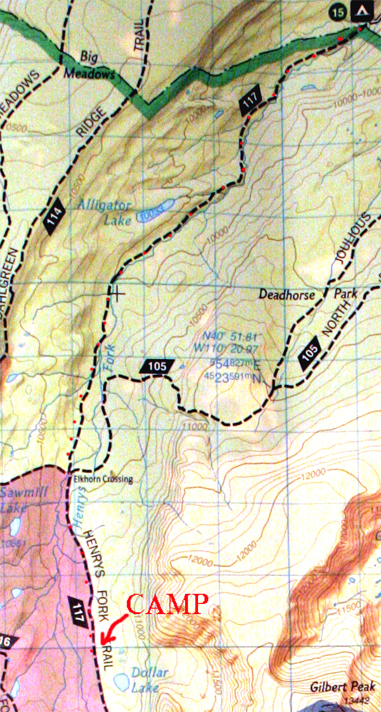 MAP 2: Camp near Dollar Lake to summit via a variation off the normal route (the chute to 11,900 feet). Map scan courtesy of National Geographic’s Trails Illustrated High Uintas Trail Map.